In 1895 one Archie MacLaren arrived in Taunton to meet a Somerset XI led by Sammy Woods, a local legend. Archie hadn’t faced any bowler over 14 years of age for five weeks, but his dad was in the crowd so he wanted to do well. Only by a squeak did he survive his first ball. A day and a half later he lobbed a catch and walked off. He’d scored 424. Gamlin was the bowler, one of nine tried. Gamlin wasn’t much of a cricketer. Sam told his chums at the Clarke’s Tap that he was playing ‘on account of being good at rugby’. Sam was that sort of bloke. Somerset was that sort of county. And he was very good – at rugby. MacLaren’s score sat in the record books, speaking of the time as might a snuff box in a museum. In a changed world it reminded us of a past of Free Foresters and Devon Dumplings. It could not be done again, could it? Golly, even Somerset rarely fielded total incompetents these days. Besides, the fielding had improved, the ball had shrunk (1927) and the stumps had grown (1931). Big scores were still possible. 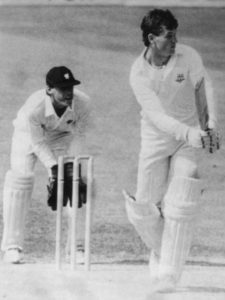 Gimblett had hit 510 in 1948 and Viv Richards 522 in 1985, but no-one had approached 400 in county cricket since the old Queen died. Had Worcestershire not declared at tea (there were no tea intervals in Archie’s day) on May 6, 1988, MacLaren’s record would have been broken. It is not for this writer to decide if Somerset’s tactics were quite as sound as those of Mr Woods, but it can be taken that our selection was rather more conservative. Moreover our fielding was good and the bowling did not flag until the second afternoon when the captain, seeing that the horse had bolted and emptied the yard besides, served up some atrocious swingers to which a tiring and expansive batsman nearly fell. Nothing was given away easily. Yet Hick scored 405 not out. One thing had changed in 1988. Four-day cricket was being tried. Batsmen could bat for two days. Some were doing so. Already Gooch had plundered 275 off Kent; and that was just in the first innings. Hick was in form too, taking 212 off the Lancashire bowlers at Old Trafford. Around the Counties, cricketers were staggered by the new scale of things. These scores were beyond contemplation. As it turned out, Hick was only warming up. At Taunton, he was nearly out first ball, clipping a drive inches off the ground in front of square leg. Our man was patrolling behind square. I’d considered moving him for Hick but had let it be for a minute, a fatal delay. Only by a narrow squeak did he avoid playing on a few minutes later. On 148 he was dropped in the gully where, ironically, he was to be caught twice in the return game a fortnight later. He never really gave Somerset a ghost of a chance until he’d passed 500. I never thought 500 could be written as if it were a staging-post. It takes me a month to score 300 runs. Once or twice his leg shots were lifted, but they were hit with a power that was efficient rather than savage and they thundered through or over the field. Standing erect and immense yet never imperious, Hick boomed drives to mid-off or through extra cover – ‘not a man move’ shots – and he late-cut delicately. Throughout he ran fast between the wickets, throughout he used a bat so broad that bowlers felt as if they were trying to knock down a tank with a pea-shooter. Yet there was never any sense of awesome personality in this awesome batting. Hick did not impose himself save as a batsman. From slip I saw a simple, straightforward fellow with a simple technique founded upon straight lines, power and fitness. Whenever possible he put his foot down the wicket and hit the ball hard. 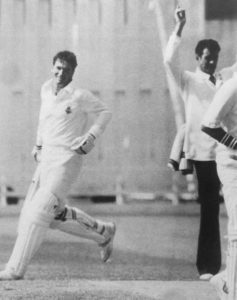 He was never as menacing as Viv Richards, whose saunter to the crease can have the effect upon a bowler that a bugle has upon a stag. 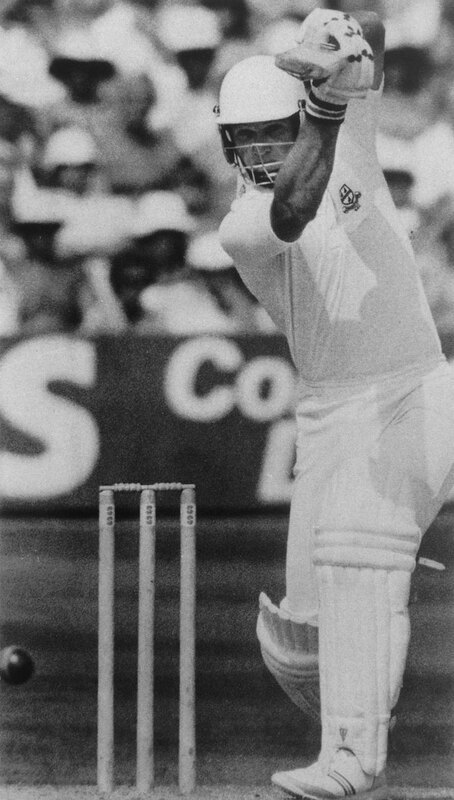 Nor did Hick coil himself into an intensity of idea, execution and will as might Martin Crowe. No. 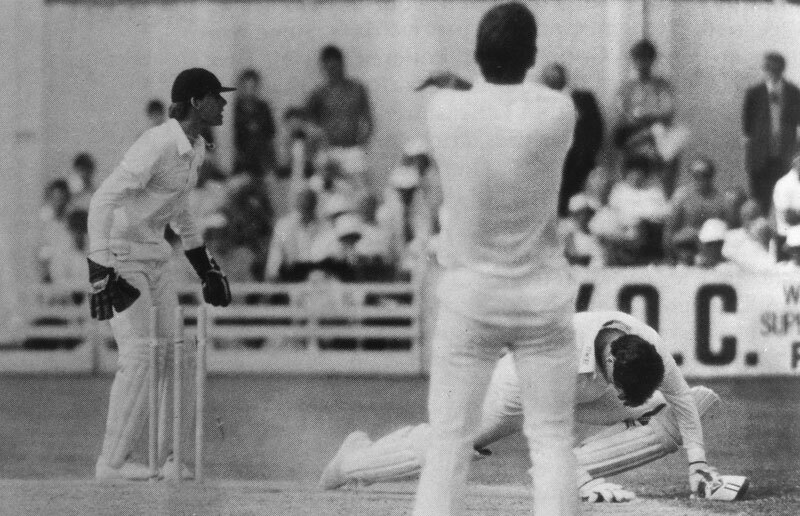 he strode to the wicket as soon as Gordon Lord was out, took guard and began hitting the ball in order to score runs. He did not say much, and yet he was neither distant nor aloof. I never saw Walter Hammond bat, but I imagine he was something like this – authoritative, commanding, civil and durable. At the crease Hick avoided flamboyance, eschewed the macho. Discipline was at the core of his game. If he was bowled a good ball he blocked it. Bad balls were hit. 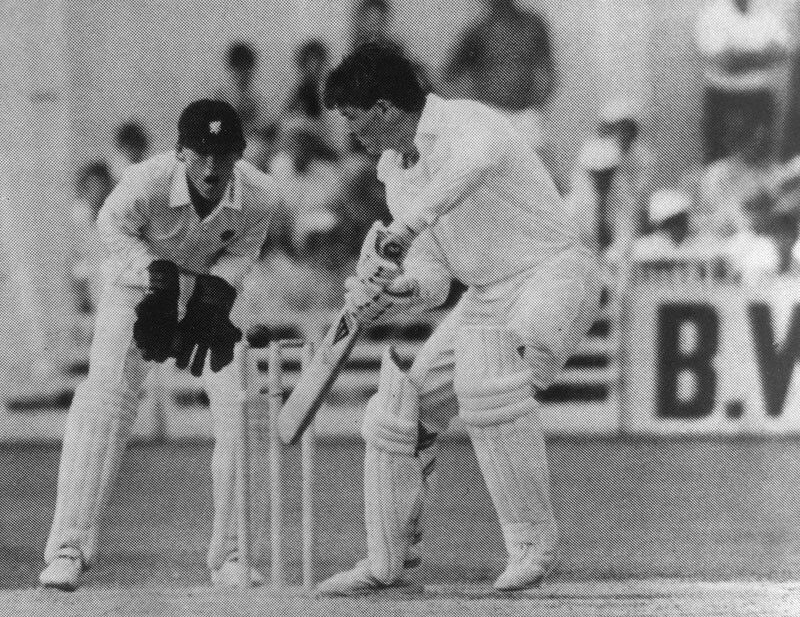 Unlike Richards or Botham he does not try to destroy a bowler’s length. Unlike lesser batsmen he never gives his wicket away, whatever his score. Watching him, you cannot tell if he is on 10 or 210. He simply carries on. His game is as pure as a punched hole. It is this that frightens bowlers. Most impressive of all, his 405 was a deeply unselfish innings. On a good pitch and in good weather his team had subsided to 152 for five. One mistake from Hick and they’d have been all out for a poor score. Yet after some hours of run-making Hick ran a fast 5 off the last ball of an over to give Newport an extra run and the strike. It was this sense of being in a team that caught our eye because it said so much about the man. We already knew he could bat. 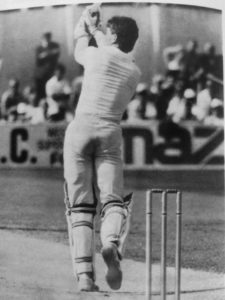 Apart from its proportions, Hick’s innings was not a masterpiece. He has acknowledged this. His hundred against a pounding West Indian attack on a dodgy Worcester wicket must have given him greater satisfaction, because there his technique, courage and temperament were stretched and did not break. And yet I wouldn’t say this was his outstanding innings either, however significant it was. Hick’s most important innings of the season was his last one, at home against Glamorgan with Kent breathing down Worcestershire’s neck and the Championship at stake. To win the title Worcestershire had to score 500 runs in their 100 overs on an unreliable surface. Glamorgan had scored 244. Their bowlers were in top form. Upon Hick’s innings hung the destiny of the Championship. Of course the game was closely followed around the counties. At Taunton, the lunch scores were read over the loudspeaker as we tucked into saddle of lamb in the dining-room. “Worcestershire 144 for three.” A colleague had time to utter the word “Hick” before the announcer continued, “Graeme Hick 74 not out”. A sigh went around the room, a reaction which spoke of the inevitability of things. It was as if we’d been told Liverpool had won the Football League. Whether joyful or sorry, no-one was surprised. Hick scored 197 and Glamorgan were duly finished off next day. During the season Hick scored 5,684 runs in all cricket; 2,715 of them in all first-class matches, a record since fixtures were cut in 1969, and 2,445 in the Championship. His first-class total of 2,615 (average 7924) for the county was only 59 runs short of Harold Gibbons’s Worcestershire record of 2,654 (average 5205) set in 1954. He equalled Glenn Turner’s Worcestershire record by scoring ten hundreds, several of them on bad wickets, and his century against Glamorgan was the 54th first-class hundred of a young career. His strike-rate of innings per hundred is 5.29. Bradman’s was 2.88, Ponsford and Woodfull‘s 5.00 and Vijay Merchant’s 5.20; then comes Hick. Uniquely he holds four partnership records for Worcestershire – the second wicket with Curtis, sixth with Rhodes, seventh with Newport and the eighth with Illingworth. No other player holds more than three records for a county. Statistics trip off the page. And he’s only 22. A retiring Somerset captain once said, “God help my successor”. People bowling to Hick feel like that. Hick suffered only two humps during the year. After his 405 not out, cameras followed him everywhere to record his reaching of 1,000 runs before the end of May. For a time he failed. Against Somerset at Worcester, he appeared agitated, rushing to the wicket, too aggressive. For once his batting was wild rather than measured. Accordingly he nearly didn’t reach his target, and it was only his masterful innings against the West Indians that got him home. He needed 155 runs in that innings, an impossible target and yet, surviving one trenchant appeal, he reached it. He failed in the NatWest Bank Trophy final. Fraser bowled fastish break-backs, searching for a crack between bat and pad and finding it with a scorcher. It was a good delivery. Fraser had denied Hick his drive, cramping him by banging the ball down the Lord’s slope. So Hick did not mark a great occasion with a great innings. In fact, you’d hardly have known he was playing. Hick prefers it this way. Ego has no part in his cricket. He talks with his bat. For Graeme Hick, though, it was a year of nearly undiluted success. He could have done no more. Yet before he can be regarded as truly great he must take command at Test level. It will not be easy. Even at county level bowlers are probing for an Achilles’ heel. Some captains think he occasionally lifts his head as he drives and set a man in at gully accordingly. But this involves bowling to his strength, and is a risk economically and, to mid-off, physically. Others try to contain him by angling the ball into his body, restricting his opportunities to hit on the rise, his particular joy. Hick pierces the off side as an arrow pierces a balloon, but his leg-side shots are a shade speculative. It is an area of hope, though the leg side is notoriously difficult to defend. Some consider Hick to be vulnerable to spin. One or two fast bowlers fancy rapping him on the gloves. To be frank it is all, like marriage, a triumph of hope over experience. I don’t think he ever will. Reproduced by kind permission of Wisden Crickerters’ Almanack. 1989.